The town of Forchheim, about 25km south of Bamberg, is best known for Annafest, a week-long beer festival which attracts up to half a million visitors each year – and one of the reasons for choosing the dates we did for our Franconian trip was so we could tag a weekend at Annafest on the end. 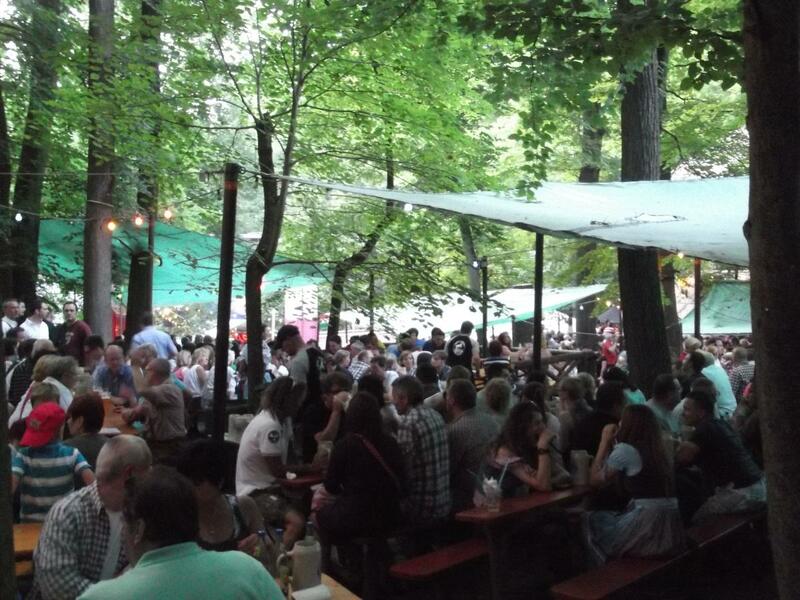 While nowhere near as well known outside Germany as Munich's Oktoberfest, it is pretty famous within the country. It takes place in the Kellerwald, or Cellar Woods, above Forchheim. What's a Kellerwald? In the days before mechanical refrigeration, brewers used caves or cellars to keep their beer cool while it matured – this is of course the lagering process. In some places they dug these cellars in the woods and hillsides, and then at some point some bright spark must have thought, "Hey, we've got all this beer on hand and a really nice location, why don't we build a bar next to the lagering cellar?" And so the Bierkeller was born – well, more or less! What with medieval towns often having a dozen or more brewers, in Forchheim's Kellerwald there are not two, not four, but 23 scattered among the woods in two main clusters, the obere and untere (higher and lower) Bierkellers. Some are open all year, but others open only around the time of the Annafest, for which each of the local breweries – there are still four in the town plus several others in the surrounding countryside – brews a special Festbier. If I understand correctly, the Festbiers were originally only available at the festival, though today that's no longer true – some are also bottled, while at least one turned up on tap in London, on the foreign bar at this year's Great British Beer Festival. We knew the festival opened on the Saturday, and the easiest thing would have been to travel down for the day. However, we also had to leave our Bamberg lodgings on Saturday, as it was already booked for the following week and Saturday is changeover day. So given that we had to move lodgings we figured we may as well head down to a Forchheim hotel for the weekend. In hindsight, going to perhaps the second-biggest beer festival in Bavaria on the opening evening wasn't the best plan ever. It was rammed, totally rammed. Queues for everything, the staff so overloaded that people were waiting up to an hour for food, and noise everywhere, from bands, from the adjacent fairground, and simply from thousands of people yelling at each other. 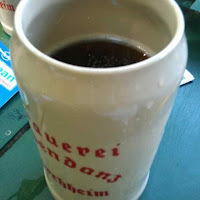 And yet, what an experience... One of the first discoveries was that the draught Festbiers are only offered for sale in litre mugs, called Maßkrugs. I discovered later that some servers might take pity and sell you a half-litre if you claim to be a poor, weak-bellied foreigner. Hm, maybe next year! For this year though it was a case of abandoning any thoughts of sampling all 10 or 11 Festbiers (most breweries now sell through multiple Kellers) and focusing instead on simply finding a place to sit. 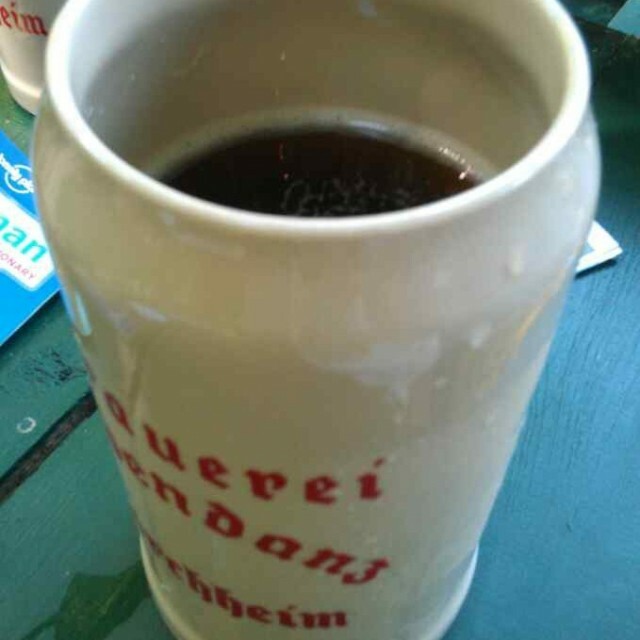 In the event we managed a litre each at three different Bierkellers – Neder, Eichhorn and Rittmayer – stretched over about three hours and accompanied by a decent plate of dinner, before giving in to exhaustion and heading back. The most amusing sight was probably three girls sharing a single Maß, via a straw. I did take surreptitious photos, but sadly lost them. We visited three diffeernt kellers on each day of our visit. Schloessa Keller (Nebendanz); Weiss-Tauben Keller (Rittmayer) and Eichhorn Keller stood out for me, but all were good. In between our visits to Annafest, we went to Bamberg (twice), Coburg and also spent an afternoon at Roppelts Keller, just below the Kreuzbergkeller complex at Stiebarlimbach. There was a fantastic atmosphere about Annafest, and we would definitely go back, probably in a few year's time. Bamberg's Sandkerwa, which is on at the moment, sounds good for next year. We'd already been to Roppelts on the opening Saturday afternoon, before Annafest got going, then on the first Sunday we left mid-afternoon and went to the Witzgall Keller. Thanks for reminding me - it means I still have at least one more write-up to do!